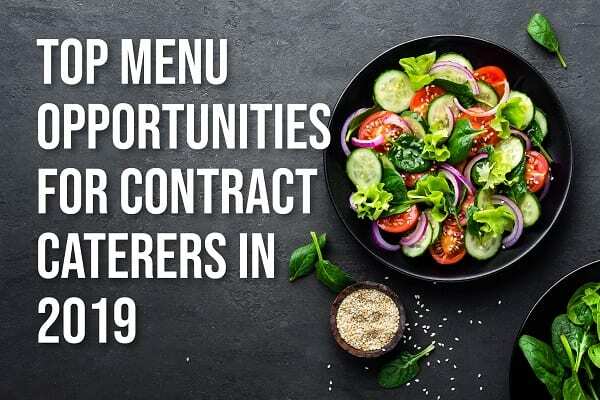 We recently conducted research partnered with ABA Market Research to understand daytime diets and meal planning for contract caterer consumers, which I have used to pick out the top menu opportunities for contract caterers in 2019. You have to keep up with innovation otherwise you stand no way of competing with what is offered on the high street. We recently launched our food and drinks trends for 2019 which is not just how and what consumers are wanting to eat and drink, but the context in which they consider the production, purchase and consumption of food and drink products. Wider macro trends continue to reveal the shifts in consumer attitudes, behaviours and lifestyles, showing how economic, technological and sustainable influences are changing how we think, how we make decisions and how we act. Set against a wider social backdrop, we have been working with food experts, research resources and various news and publication channels to develop a selection of ten food and drink trends for the year ahead. In contract caterer sites, consumers are looking for innovation to avoid repetition, however, they tend to keep it reasonably safe with well-established foodie trends since authentic Asian and street food are the most popular. Street food is huge and to acknowledge this our next innovation wave in March this year will be “Street Eats” which showcases all the latest NPD and recipes we have to support you with this ever-growing trend. Another tool we have available to support you with innovation is my latest campaign, Fast Flexible Flavour. This campaign looks to support you with providing flexible products that over deliver on flavour and have multiple uses. The products used incorporate current trends that customers are looking for and will support you with refreshing your menus. All products included in the brochure are highly versatile and can help you with saving space because you will need fewer products as a result. Please click here to find out more about this campaign. ‘Healthier options’ are the number one thing customers want to see in contract catering sites in the next 2-3 years, with 40% of people wanting this more on menus. The key area of focus is not to just look at serving healthy options but by offering balanced choices on the menu. Providing menu transparency through things like calorie counters or labelling, and reducing portion sizes or offering options for smaller portion sizes at a cheaper price point are a great way of supporting consumers with balancing their diets. If you want to know more on this, my previous blog on “Top tips for catering to health conscious consumers” discusses these key focus areas in greater detail. To get customers on-site, decision making needs to be seamless. Due to advances in technology, for example, contactless payment, online deliveries, and tap and go cards, consumers expect a service that is tailored and easy for them. Online ordering is a fantastic way of keeping up with consumer demand, since 82% of UK employees would buy meals more often from their workplace canteen if they could order ahead and pick it up from a dedicated service point, according to research conducted by Omnico and The Caterer magazine. The same research stated that a leading factor to this is how time poor consumers are and found that a staggering 61% of employees do not visit their in-house catering because they do not want to face the queues. Bakery chain Greggs are already trying to tailor their offering to this growing trend by trialling click and collect services in their sites. I expect this will only become more of a focus for high street chains as they try and make themselves more convenient and appealing for their customers. Another element of complexity consumers want to remove is not being able to personalise food choices. In fact, being able to customise your meal is the number one factor that consumers say would make them use on-site catering a lot/a little more often if available. Personalisation is changing the face of the food and drink industry and it is a great way to help you stand out from the competition by offering an experience that feels tailored and personal to aid your consumers with their decision making. I have previously discussed this topic in greater detail in my blog on ‘Why personalisation is a must’. Traditional dining tables have been changing over the last few years and continue to do so. Consumers, particularly millennials, are daring to dine out outside the usual meal clock. Whilst in the workplace, employees are continuing to become more time poor so all-day options are becoming more appealing, particularly with snacking. 47% of trips to the workplace restaurant are for a snack, and only 1 in 5 of people know exactly what they want to buy before they go in which suggests there are opportunities for impulse purchasing. It’s important that you change your layout of your offering throughout the day to take advantage of this. For example, placing chocolate near the tills after lunch to encourage consumers to purchase a bar for a mid-afternoon snack, or by having porridge pots visible through the morning so consumers who have little time can quickly grab it and go. This growing trend is acknowledged in our “It’s snack time!” brochure which discusses the differing snack needs throughout the day with helpful tips on how to make the most of it throughout. All that I have spoken about here is easy for you to adapt into your offering and could have a massive impact in making your menus more appealing to consumers. For any further support or advice on top menu opportunities for 2019 specifically to you, get in touch with your account manager today.